A complete study of the use of acids in homeopathy. A fascinating book from the late French homeopathic paediatrician Patricia Le Roux, in which she displays the impressive array of her talent. Rigourous in her research, intuitive and discerning in her practice, she presents new information on twenty-seven acids and cases of children she has treated. As the 21st century dawns one of the most crucial changes in the history of man is impending. We are about to witness the replacement of traditional fossil fuels - like coal, oil and natural gas - by an energy which is clean and inexhaustible: in other words, hydrogen. Hydrogen is already being used within the realms of homeopathic medicine, and recent provings and research have demonstrated exciting applications. 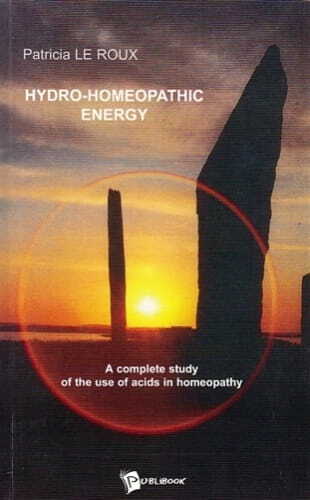 In this fascinating book, pioneering homeopathic paediatrician Patricia Le Roux reveals her detailed and rigorously documented study of hydrogen and the rest of its' family of remedial acids, using clinical case histories from her day-to-day work as a clinician to illustrate her researches. Homeo-hydrogen works on the energy of our bodies, and is universally applicable within our stressful modern society, offering creative, original, therapeutic solutions to countless contemporary ailments. Tomorrow's world is already with us, and Homeo-Hydrogen is its impressive, energetic proof. This is a delightful book. Despite my misgivings, I have learned much from reading it and will heartily tell everyone to read it. I soon realised that I was reading cases and clinical results from a homeopathic genius and the sheer delight at her artistry took over, the errors (since corrected) receded into the background. Old remedies have sprung to life with new information for 27 acids. Don't let them drop. Her main clinical theme is the variety of uses for acid remedies in paediatrics. She displays short vignettes of the children (and their parents) whom she has treated, finding some rare and interesting rubrics from her sensitive discernment of their behaviour and family dynamics. It has made me go over some old case files, and I look forward to a new approach next time I see some of my young patients. She also discusses the overall themes of acids as dependent on hydrogen and the theme of unification and unity which underlies the acids, as well as the weakness and torpor which is well known. Single remedy prescribers are rare in France, perhaps only ten percent of French homeopaths are 'uniciste', and many are now centred on the Hahnemannian school of Frejus and Didier Grandgeorge, where she is also an active member. She has relied heavily on three sources: Murphy's Materia Medica which of course is widely available, and in turn relies heavily and without shame on other well known sources, especially Clarke, Boericke and Julian. Le Roux quotes liberally from Murphy. Another reference is Scholten, who is a source of inspiration, themes, ideas and hypotheses rather than straight information. And lastly she uses van Zandvoort's Complete Repertory to identify strange rare peculiar and characteristic symptoms directly from the ReferenceWorks software (in which her book has also been included). So her cases are always backed up by more or less original evidence. It is of course an expression of hubris to call any book Complete as did Roger van Zandvoort. His repertory was never complete and he never stopped correcting it and adding to it. This complete study of acids omits quite a few, for example: Arsenicous (our Arsenicum album is an acid); Desoxyribonucleinic, (much has been written about DNA as a remedy, a good source is Vermeulen Synoptic 2, which emphasises its use in paediatrics; she writes fully about RNA so this omission is puzzling); Camphoric (little known); Malic (not used in homeopathy but perhaps should be as a companion ingredient of wine with Tannic and Tartaric); Pyrolignosic (proved long ago but not used); Succinic (conflated with Succinum itself - Amber - by Clarke); Sulphuricum acidum aromaticum (little used); Sulphurous, (an atmospheric pollutant which I have used in symptoms like hay fever when the pollution count in London was high); Tartaric (as weak as all the others 'feels very tired, can scarcely drag himself along' writes Clarke) and Telluric (little known). Carbonic acid is not in our literature but perhaps should be. I was taken aback at first by the small mistakes in punctuation and grammar, especially in the footnotes, and the infelicities of translation, where French words had been transliterated rather than translated. These have largely been corrected in a new edition. The amount of information and cases, the number of acids which are described, and the humane style all add up to a very readable and useful new book.